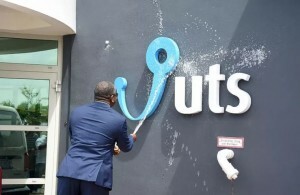 WILLEMSTAD - The telecommunication company UTS announced that it will continue with its plans to lay off employees. More than half of the nearly 500 employees will have to leave the company. In three years’ time, the company must reduce its workforce to 200 employees. Due to the high costs of pensions, about 40 million guilders, the company says it cannot compete against its competition. UTS will first request voluntary resignation. If that does not lead to sufficient results, then the first resignation rounds will begin in January 2018. For years, UTS has been in a difficult situation because of the constant technological innovations and the great competition.